Elongated chalcedony in small rounded forms, coating an elongated crystal that had been a chrysocolla pseudomorph after an unknown mineral, now completely replaced by the chalcedony, coated by a powdery limonite. 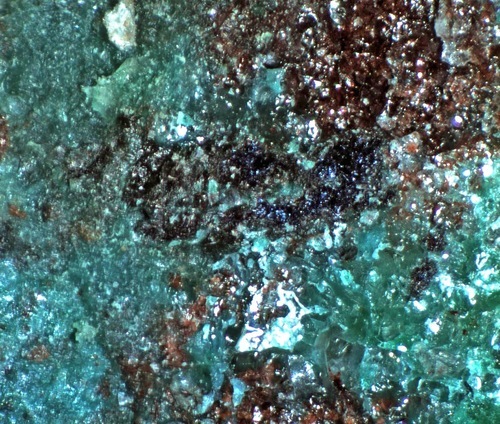 There are elongated chrysocolla clusters on other parts of the specimen that have not been replaced but are partly intermixed with chalcedony. Collected by Dan Stephens. Rolf Luetcke specimen and photo. 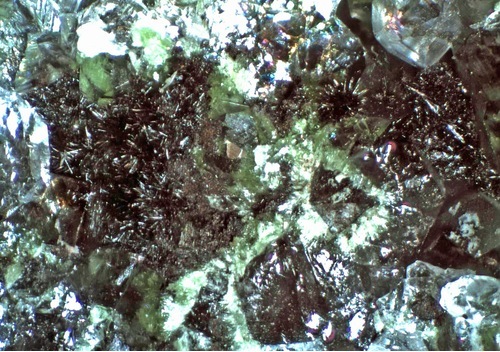 Black, needle-line crystals of plattnerite with green conichalcite in quartz. Collected by Dan Stephens. Rolf Luetcke specimen and photo. 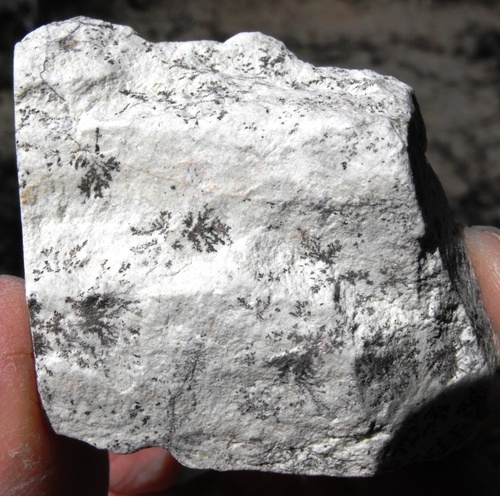 White plates of muscovite in quartz with minor chrysocolla. Collected by Dan Stephens, Rolf Luetcke specimen and photo. 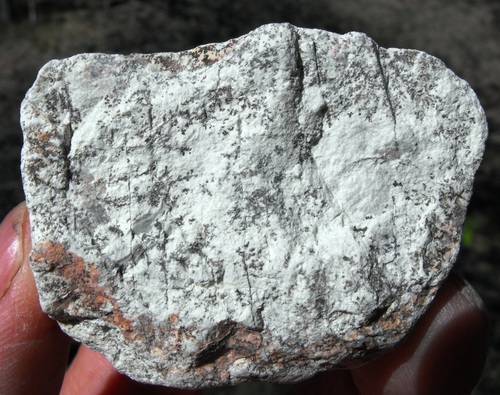 White, massive kaolinite with red-brown dendrites of hematite. Collected by Dan Stephens, Rolf Luetcke specimen and photo. 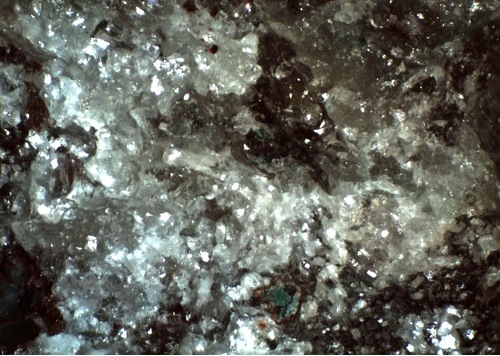 Blue-purple, platy covellite with green malachite in quartz matrix. Collected by Dan Stephens, Rolf Luetcke specimen and photo. 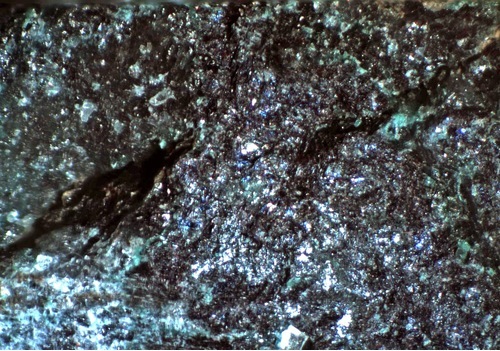 Blue, massive, metallic bornite with green malachite and minor quartz. Collected by Dan Stephens, Rolf Luetcke specimen and photo. 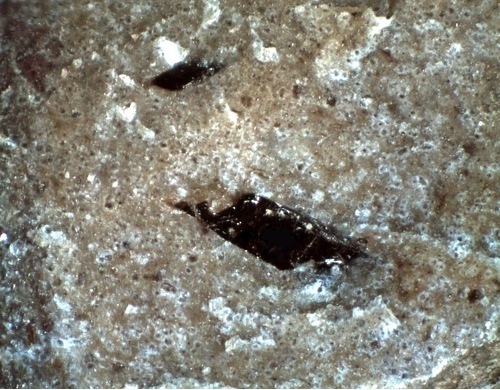 Black biotite in matrix of quartz. Collected by Dan Stephens, Rolf Luetcke specimen and photo. 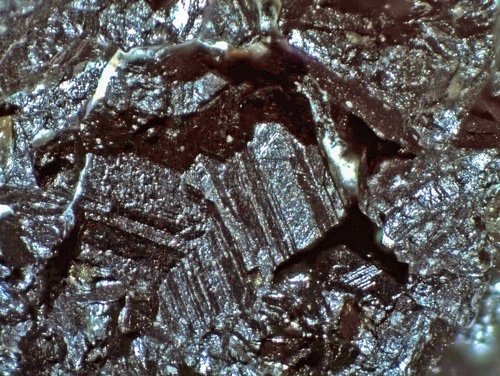 Dark brown sphalerite crystals from a collecting trip to the Morenci Pit in the 1990's. 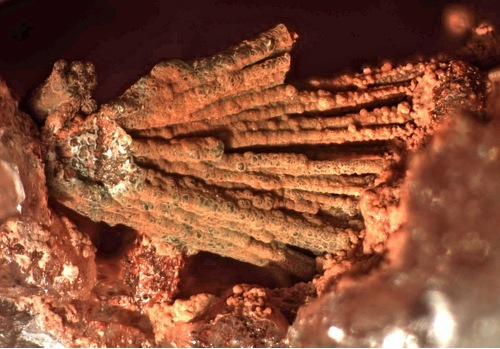 Rolf Luetcke specimen and photo. 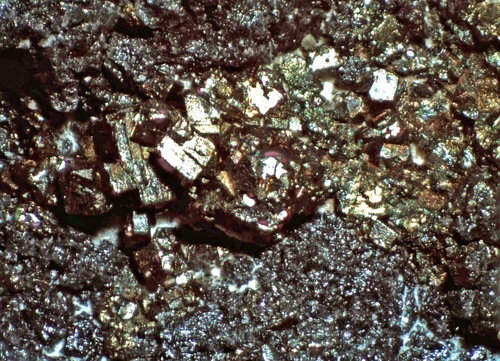 Golden, cubes of pyrite crystals on dark brown sphalerite. Self collected in the 1990's on a collecting trip to the pit. Rolf Luetcke specimen and photo.